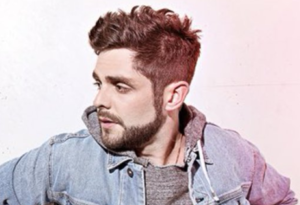 Thomas Rhett has been on a string of hits. Mostly all positive and happy. And it’s been cool. He seems to be in a great place in life right now. When I saw this title, though, I cringed a little. I thought maybe it was another one his happy life songs. And that would have been fine, but life isn’t all happy. Then this one started playing and it blew me away. A story song. A sad song. A country song. I don’t know why we like sad songs so much. Not all the time, but some of the time. I think it’s because they remind us that we’re not the only ones in the world that feel sad sometimes. The story going on here is a guy at a wedding. He was invited by the bride. They’ve been friends for a long time. She think it’s the best day of her life and that all her guests are happy for her. But this one guy. This one friend. It’s killing him. He’s wanted to be more than friends since the moment they met, but for whatever reason things never got past the friend zone. So he’s finally letting her go. At least in his mind. She never had any idea. This one threw me for a bit of a loop. I wasn’t expecting this direction with the title, but I was pleasantly surprised. Thomas is at the top of the country game right now. This is another good one to add to the catalog of hits.